But then I received my #FallenEmpire bracelet at the SWTOR Community Cantina at Star Wars Celebration Anaheim, and I got a little tingly all over. The fact that a full panel of key writers and developers had assembled at an important convention to talk about upcoming SWTOR content gave me the sense that maybe EA/BioWare hadn’t forgotten about the game entirely after all. 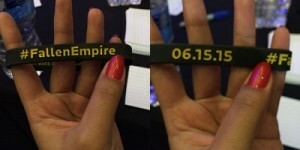 The #FallenEmpire bracelet was a tease, a wink. 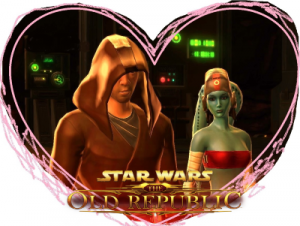 SWTOR was flirting with me, and I was interested. Fast-forward to E3 in June and suddenly SWTOR was John Cusack standing on my lawn with the Knights of the Fallen Empire trailer streaming out of the boom-box overhead. This was the grand gesture I had been waiting for. Story like Mass Effect, you say? Choices that matter? Keep talking SWTOR, you have my attention. If the E3 reveal was a companion gift to max my affection, it is clearly working. Quality of life enhancements such as the outfit designer, improved travel convenience and inexpensive server transfers have helped keep me engaged as we approach the October expansion. I have noticed more community presence from the game and a new and welcome transparency when things don’t go as planned. So yeah, things seem to be going well with SWTOR and me these days. Next weekend we are going on another date, this time at the San Diego Comic Con Community Cantina. Romance is in the air and I just can’t wait to see what happens next.